Purpose: The purpose of this study was to assess the oral health needs of community-dwelling older adults participating in congregate meal centers and to determine whether differences exist in the oral health needs of older adult populations residing in urban versus rural communities in the state of Texas. Methods: Study participants were recruited at 6 congregate meal centers located in identified rural and urban communities in the greater metropolitan area of Austin, Texas. (N=78) Participants completed a validated, modified questionnaire containing 20 items on the following topics: self-reported oral health, tooth loss, dental insurance, frequency of dental visits, time since last dental visit, access to dental care, dry mouth, and oral cancer screening. Each participant received an oral health screening based on the Association of State and Territorial Dental Directors Basic Screening Survey for Older Adults. The examiners received hands-on training prior to the study to ensure the validity of their findings and to test for inter-examiner reliability. The chi-square test of independence was performed to analyze the participants' responses on the Basic Screening Survey to identify any relationships between the variables. Results: There were no significant differences in oral health conditions of older adults residing in urban versus rural communities. Over 50% of the participants (64.9% urban; 56.1% rural) reported incomes below $15,000 and lacked dental insurance to cover all or a portion of their oral health care needs. Eighty-seven percent of the participants reported tooth loss due to dental caries, 35% required periodontal care, and 37% reported occasional and 43% reported frequent oral pain over the last 12 months. Conclusions: Oral health promotion and disease prevention is an emergent need for older adult populations residing in urban and rural communities of the state of Texas. Analysis revealed that the majority of the older adult populations in both settings to have financial and socioeconomic barriers to access preventative and restorative dental care services. The purpose of this study was to assess the oral health needs of community-dwelling older adults participating in congregate meal centers and to determine whether differences exist in the oral health needs of older adult populations residing in urban versus rural communities in the greater metropolitan area of Austin, Texas. This cross-sectional observational study was part of a statewide study conducted in Texas to determine the oral health needs of community-dwelling older adults attending congregate meal centers while also participating in Medicaid, Medicare, and other state assisted programs for low income adults. Inclusion criteria were adults aged 65 years and older who participated in the congregate meal center activities. Participants were recruited during an oral health education presentation and were provided with a recruitment letter in English and Spanish. Study participants reviewed and signed informed consent forms prior to receiving the questionnaire and oral screening. The Association of State and Territorial Dental Directors (ASTDD) Basic Screening Survey (BSS) for Older Adults Toolkit was used for the study.25 The toolkit included examiner training materials (PowerPoint presentation and video), screening form, and participant questionnaire. The training video and manual was used for hands-on examiner training to ensure the findings were valid and could be replicated between the examiners. Two examiners, a dentist and a dental hygienist, acted as examiners for the study. To maintain ongoing calibration, every tenth participant was screened by the two examiners independently to maintain calibration and validate the findings. The BSS questionnaire utilized questions from the NHANES (National Health and Nutrition Examination Survey), BRFSS (Behavioral Risk Factor Surveillance System), and NHIS (National Health Interview Survey) surveys. The topics in the BSS questionnaire included: self-reported oral health, tooth loss, dental insurance, frequency of dental visits, time since last dental visit, access to dental care, dry mouth, and oral cancer screening (20 items).25 The ASTDD recommended addition of demographic questions (5 items).25 Validation information was not provided in the ASTDD BSS for Older Adults Manual. The participant questionnaire was made available in English and Spanish. Descriptive statistics were used to describe the differences between the demographic characteristics and the oral health conditions of the participants in the study. All statistical analyses were performed in STATA® statistics/data analysis software version 14.0. A chi-squared test of independence was utilized to analyze the questionnaire data and the oral health assessment data for relationships between the following variables; including: oral health conditions, economic, and demographic conditions of the participants. A total of 78 volunteers (n=37 urban, n=41 rural) participated in the study. No significant differences were found in demographic characteristics between the urban and rural populations. (Table I) The majority of the survey participants were women and reported family incomes of $10,000 - $14,999, making them ineligible for Medicaid.25 However it is worth noting that these individuals were also unable to afford the out-of-pocket costs of dental services through the Medicare Advantage program.8 The majority of participants in both the urban and rural communities reported a lack of dental insurance coverage to pay for either all or a portion of their dental care costs (64.9% urban, 56.1% rural). Demographics of Urban and Rural Communities in Austin, TX. 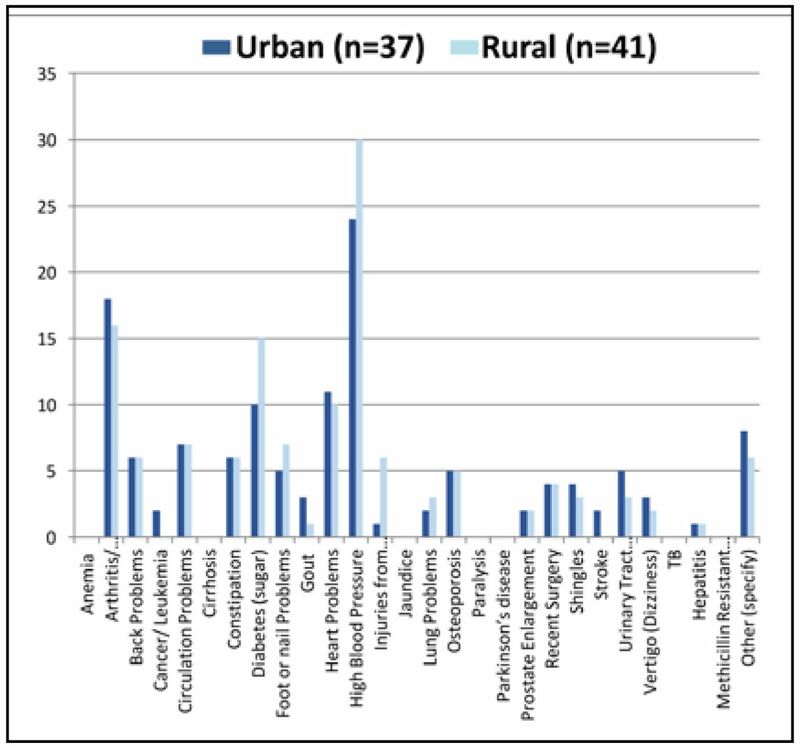 Oral Health Conditions of Urban and Rural Communities in Austin, TX. Limitations of this study include the potential for the inaccurate recall of the study participants influencing the responses to the self-reported survey questions related to demographics, oral health history, and general health. Future studies should focus on examining the multiple issues related to access to oral health care for community-dwelling older adults throughout the state of Texas as well as other states. Oral health promotion and disease prevention is an emergent need for older adult populations residing both urban and rural communities in the state of Texas. More research is needed in these populations to assess the impact of the lack of access to routine dental services on oral as well as systemic health. As the older adult population continues to increase, oral health care will play a crucial role in the overall management of systemic diseases accompanying this age demographic. Demand for oral health care services will increase as more older adults choose to live independently within their communities. With limited coverage of Medicaid and Medicare for preventive and restorative dental services, the expansion of services provided by oral health care professionals may assist in supporting overall health and wellness. Julie L. Martin, RDH, MS, MPH is a graduate of Forsyth School of Dental Hygiene, MCPHS University; Boston, MA; Linda D. Boyd, RDH, RD, EdD, is the dean, Forsyth School of Dental Hygiene, MCPHS University; Boston, MA; Helena Tapias-Perdigón, DDS, MS; a Clinical Assistant Professor at Texas A&M University College of Dentistry, Dallas, TX; Lisa LaSpina, RDH, MS, is an assistant professor, Forsyth School of Dental Hygiene, MCPHS University; Boston, MA. This manuscript supports the NDHRA priority area Population level: Health services (epidemiology).
. Socio-demographic factors and oral health conditions in the elderly: a population-based study. Arch of Geront Geriatr. 2013 Nov-Dec;57(3):389-97.
. The effect of programs to improve oral hygiene outcomes for older residents in long-term care: a systematic review. Res Gerontol Nurs. 2014; Mar-April 7(2):87-100.
. Positive health outcomes following health-promoting and disease-preventive interventions for independent very old persons: long-term results of the three-armed RCT elderly persons in the risk zone. Arch of Gerontol and Geriatr. 2014 May-Jun;58(3):376-83.
. Systemic inflammatory markers, periodontal diseases, and periodontal infections in an elderly population. J Am Geriatr Soc. 2005 Sep;53(9):1532-37.
. Factors influencing oral health-related quality of life (OHRQoL) among the frail elderly residing in the community with their family. Arch Geront and Geriatr. 2010 Nov-Dec;51(3):e62-e65.
. Managing dental pain in the emergency department: dental disparities with practice implications. Adv Emerg Nurs J. 2013 Apr-Jun;35(2):95-102. Cognitive impairment, oral self-care function and dental caries severity in community-dwelling older adults. Gerodontology. 2015 Mar;32(1):53-61.
. Demographic factors associated with dental utilization among community dwelling elderly in the United States. J Public Health Dent. 2006 Winter;66(1):67-71.
. Tooth loss and mortality in elderly Japanese adults: effect of oral care. J Am Geriatr Soc. 2013 May;61(5):815-20.
. Relationship between nutrition status and dental occlusion in community-dwelling frail elderly people. Geriatr Geront Int. 2013 Jan;13(1):50-4.
. A systematic review of oral health outcomes produced by dental teams incorporating midlevel providers. J Am Dent Assoc. 2013 Jan;144(1):75-91.
. Dental education and changing oral health care needs: disparities and demands. J Dent Educ. 2012 Jan;76(1):75-88.